Spinal Stenosis a medical condition where an area of the spine narrows — usually in the neck or lower back. This will compress the spinal cord or nerves. Based on the specific nerves affected, Spinal Stenosis may create pain or numbness in the neck, back, shoulders, arms or legs. There are various types of problems that can reduce the amount of space inside the spinal canal. The possible causes can range from birth defects to cancerous tumors, but age-related degeneration is the most common cause of Spinal Stenosis. Disc Degeneration. As a person ages, the cushions that separate their vertebrae flatten and spread. As time goes by, the hard, fibrous outer shell of the disc could develop tiny tears. This will cause the jelly-like material in the disc’s center to leak and press on your spinal cord and nerve roots. Chiropractic care and Spinal Decompression Therapy can both help elongate the spine and joints as well as assist in the symptoms of this condition, eliminating the need for unnecessary drugs or surgery. Osteoarthritis. Just like the discs above, the facet joints between the vertebrae in a person’s spine can deteriorate. The body will attempt to heal itself. Bony growths called bone spurs are usually a by-product of this. These spurs may narrow the spinal passages. The beginning of this condition could be known as Foraminal Stenosis, Facet Imbrication or Facet Syndrome. Just like above, chiropractic care and Spinal Decompression Therapy can help elongate the spine and joints and assist in the symptoms of this condition, alleviating the need for unnecessary drugs or surgery. Thickened Ligaments. Ligaments are made of a tough, fibrous material that assists in holding a person’s bones together. They may stiffen and thicken over time. This thickening can also narrow the spinal canal and compress nerve tissue. Spinal Tumors. Abnormal growths may develop inside the spinal cord itself or in the area that separates the cord and vertebrae. As they grow, these tumors could compress the spinal cord and nerve roots – only a specific MRI or CT Scan of the spine can further evaluate this. It is usually when the symptoms are severe, not going away and preliminary care is not getting results that this diagnosis is even considered. Many people come into my office terrified that this is the reason they are having pain and it is certainly not! We will evaluate them to see if conservative care is indicated. If not, a referral to a specialist will occur. Spinal Injuries. Any major trauma could cause fractures of one or more vertebrae. Bone displaced from a spinal fracture could damage the inside of the spinal canal. Swelling associated with back surgery could also create pressure on the spinal cord or nerves. Paget’s Disease of the Bone. People with Paget’s Disease develop new bone faster than the normal rate. The new bone growth is weaker than normal producing soft bones susceptible to fracture. These bones could also develop deformed or abnormally large. This could decrease the space available in the spinal canal. Achondroplasia. This genetic disorder slows the rate at which bone forms during fetal development and in early childhood, resulting in dwarfism. People who have this condition are born with narrow spinal canals, so this is a genetic reason for Spinal Stenosis. Evidence of Spinal Stenosis could very easily be visible on X-rays, but the patient will show no signs or symptoms. When the symptoms do develop, it is usually a gradual process that worsens over time. Again, these symptoms mimic those of Spinal Stenosis but is not technically this condition. Neck or Shoulder Pain. Pain occurs when the nerves in the neck are compressed. Cervical Spinal Stenosis can often be absent of pain though. If a patient is suffering from neck pain, they should make sure of what the proper reason is for this. A chiropractor is a natural choice here when first encountering this problem. Numbness or weakness. Numbness, weakness or tingling in a leg, foot, arm or hand could affect a person’s grip, balance and even their ability to walk. Again, the nerves of the neck go out to the shoulders, elbows, wrists and fingers so symptoms like weakness, spasms, numbness or tingling can be felt there. The nerves of the lower back go out to the hip, leg, knees, ankles and feet so symptoms like weakness, spasms, numbness or tingling can be felt here too. Loss of bowel or bladder control. 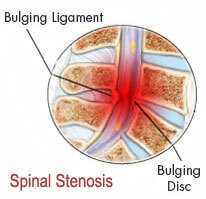 Lumbar Spinal Stenosis can affect the nerves to the bladder or bowel resulting in incontinence. This is a serious condition and must be dealt with ASAP. Pain and/or cramping in the patient’s legs can occur when standing or walking for extended periods of time. This will usually decrease if the patient bends forward or sits down. Spinal Stenosis can be a difficult condition to diagnose because the signs and symptoms resemble many other age-related conditions. Tests may be necessary to help diagnose the cause of a patient’s discomfort. Spinal X-rays won’t necessarily confirm that someone has Spinal Stenosis. It will help rule out other problems that could cause similar symptoms. In most cases, an MRI is the best choice for diagnosing Spinal Stenosis. It can produce cross-sectional views of a person’s spine that X-rays can not. Damage to discs and ligaments can be seen, as well as the presence of any space occupying lesions which would produce pressure on the spinal cord or nerves. Computerized Tomography (CT) combines X-ray images taken from various angles to create detailed, cross-sectional images of the body. It is able to show the shape and size of a patient’s spinal canal. In a CT myelogram, the scan takes place after a contrast dye is injected into the spinal column. This will outline the spinal cord and nerves and could also reveal herniated discs and bone spurs besides the diagnosis of Spinal Stenosis. In the past, the treatment for those suffering from Spinal Stenosis was mostly composed of surgery. This concept is slowly starting to evolve as more physicians are recommending alternatives to surgery being the first option. The most popular alternative is chiropractic care – specifically doctors trained in Spinal Decompression Therapy. This will help to very accurately traction the spine –either the cervical, thoracic or lumbar area (neck, mid-back or low-back). It gently opens up the space where the spinal nerves exit. This allows an “imbibition” or a pumping action to occur as the discs are able to obtain proper blood and nerve supply during the 12-15 minute session. Most people actually almost fall asleep as the sessions are that relaxing! It may seem like a simple procedure that could not do much permanent change, however our patients notice a dramatic difference after just a few visits. It makes sense mechanically and clinically to approach the treatment of this condition in this manner since it is compressive and obstructive in nature. Our care does the opposite to the spine – expansion and motion – which has been shown to be effective with Spinal Stenosis patients.